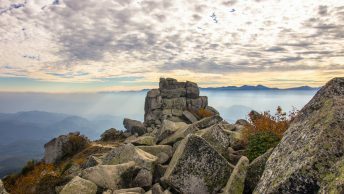 This hike follows a well-worn trail to Mt. Kobushi from Kawakami Village in Nagano Prefecture. Whilst this route was leisurely paced over three days it would normally be tackled as a two-day hike. 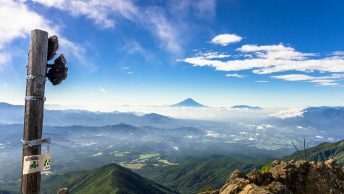 In fine weather the summit affords an excellent panorama over the Okuchichibu Mountains and beyond. The directions to the start of the trail are much the same as this nearby hike in Kawahake, Nagano with exception being getting off the bus a little further along the Kawakami Valley at the Azusayama 梓山 bus stop (550 yen). From the bus stop head over the bridge which sits beside a Chichibu Tama-Kai NP signboard and 5 minutes further along look for a blue road sign motioning the way to Moukidaira 毛木平. The 50-minute walk along the road is quite exposed with few areas to hole up in inclement weather. At Moukidaira finds a car park, undercover areas and restroom facilities. It makes an ideal spot to take an early lunch especially if you’ve travelled from central Tokyo. From the car park it takes approximately 3 hours to reach the headwaters of the Chikuma River 信濃川 and the first nights camping site. Most folk heading up to Mt. 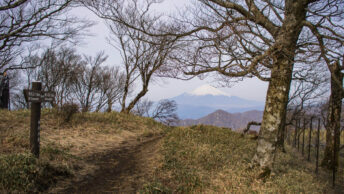 Kobushi follow this trail in both directions as its the quickest way to the summit as opposed the route up from the Nishizawa Keikoku via Mt Tokusa which is ranked as one of the hardest climbs in the Kanto Region. The trail for the most part follows alongside the watercourse though occasional tracks up the verges. Around 90 minutes from Moukidaira you will arrive at the gentle flowing Nametaki Falls ナメ滝 which resembles a long natural waterslide. From the waterfall the trail crosses the river by means of a newly built bridge and should take a little over an hour to reach the headwaters. In fact, the underground spring here constitutes the official starting point of the Shinano River – the longest river in Japan (in Nagano it’s called as the Chikuma River). A clear starry night had given way to low lying cloud and mist by morning. Rather unfortunate as if it had been a day later, I would have been blessed with excellent views. After eating breakfast, I made haste for Mt. Kobushi 甲武信ヶ岳 (2,475 m) though by the time I arrived at the ridgeline the wind had already strengthened. From the ridgeline I repeated my footsteps from a few years back on the Mt. Kinpu hike where I was similarly greeted with whiteout conditions at the summit. At least I could console myself with having my brief moment on the summit in solitude. With the weather beginning to shift from mist to rain by the minute it was time to start heading down. It should be mentioned that the trail to Jumonjitouge Pass 十文字峠 is noticeably more challenging than the previous days Nishisawa course. From Mt. Sanpo 三宝山 (2,483 m) the highest mountain in Saitama Prefecture through to the Shiriiwa rock 尻岩 its trouble-free. Traversing past Bushin Shiraiwa 武信白岩 (climbing prohibited) through to Jumonji Koya Hut 十文字小屋 requires close attention to your footwork with plenty of tree roots and lose rocks to bring you unstuck. From Mt. Oyama 大山 (2,225 m) down to the hut necessitates climbing down a series of chains which was a little unnerving, especially alone and in the wet. Finally, I arrived at the Jumonji Koya Hut (campsite 1,000 yen) around mid-day to a warm greeting, the midday TV weather forecast and some hot tea thanks to the kind caretaker. The campsite conjures an enchanting effect in the rain and was relieved to find a nice flat spot to while away the hours under the pitter-patter of my tent fly. Waking up to clear skies made for a pleasant change and I was even happier to find the fresh breeze had miraculously dried out my tent. The previously day the hut owner was kind enough to let me collect water from the outside sink but I also noticed there was a sign pointing to a nearby waterhole which I decided to check out a short 5-minute walk away. The mornings objective was to complete the circuit back to Moukidaira which is thankfully much easier than the previous day. After following a path dug into the mountain side there is a long section of tightly wedded switchbacks down to the river. From here on following the trail can be hazy at times though kudos to the pink navigation ties that keep you on course. After passing a couple of waterholes the trail finally crosses the river one final time before popping out at the scenic Sagiribashi Bridge about 500 metres from the car park. Excellent photos and commentary of your trek David! I will let Nan know you are keeping up the family tradition of walking and keeping fit! Essential to making it to 100? Thanks for that Brenda 🙂 I feel privileged to undertake each hike and reveal a little about these beautiful mountains…Indeed Nana is wonderful example that keeping fit and healthy goes a long way to making it to a ripe old age.